Unique Pike Place Market Perspective, on our stairwell wall; 2nd floor of Lowell’s! 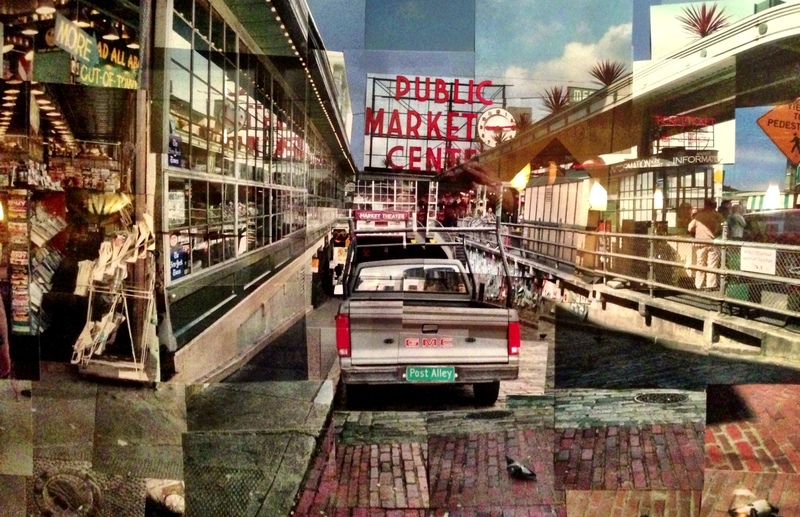 We’ve hung a framed accumulation of a couple hundred color photgraphs of the entry to Pike Place Market, showing a slightly “fractured” perspective, which personifies all of the diversity surrounding the visitors daily! This is just one vantage point, we’re inspired to make more, from all of the different angles around all of the different hidden spots in the market. I figure we should be done in about, well, NEVER! Too many diverse perspectives, come find them, we’ll gladly point out some when you visit Lowell’s! Cheers to all on this 2013 President’s Day Weekend. Celebrate the diversity of America, and our continuing progression towards truth and the recognition of all created equal, which we at Lowell’s never needed convincing of, we love ya all! Detail of our 2nd floor bar landing “photo-art”, shot by our friend John at the entrance to the market!